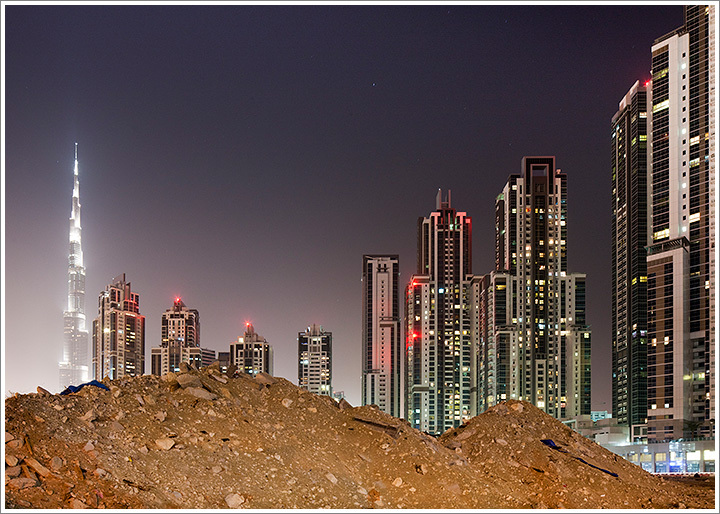 Debris pile and Burj Khalifa and construction site of new office towers and apartment blocks in Business Bay district at night. Photographed February 23, 2011 with a Canon EOS-1Ds camera and 70-200mm lens. Exposure 30 seconds at f/11. This entry was posted on Wednesday, February 23rd, 2011 at 7:54 pm. It is filed under On the Road and tagged with Architecture, Dubai, Middle East, United Arab Emirates. You can follow any responses to this entry through the RSS 2.0 feed.